Accessorize your outfit with these fashionably cool sunglasses! 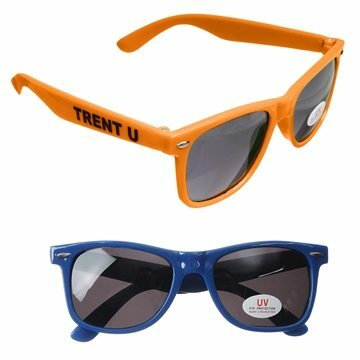 Offering 100% UVA and UVB protection for the harmful rays of the sun, these assorted colored glasses will also help build your brand awareness. This profile-raising merchandise is fitting for tradeshows, resorts, fundraisers, or amusement parks. Have your company name or logo printed on the temple and make this promotional product a must-have fashion accessory! NOTE: Product comes with Prop 65 warning label when shipped to California. Label reads: "WARNING: This product may contain carcinogen, which is known to the State of California to cause cancer. For more information, go to www.P65Warnings.ca.gov. It's my job to process a second order which is very simple and fast to process. Again, AnyPromo delivers. Fast and nicely done...it's why I keep coming back! Very cool giveaway indeed. They looked extremely professional plus were completed on time. You have excellent customer service and timely delivery.